Are you ready to learn about Bronchoprovocation Challenge Testing? I sure hope so because that is what this study guide is all about. A Bronchoprovocation test, also known as a Methacholine challenge test, is performed to evaluate how responsive your lungs are to things in the environment to help evaluate symptoms suggestive of asthma. As a Respiratory Therapist, this is yet another pulmonary function test that you must know and understand how to perform. 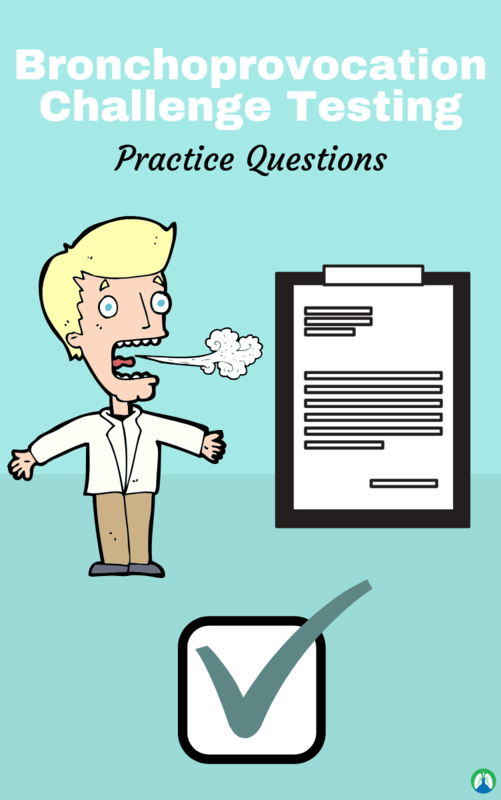 The practice questions listed out for you below can help you do just that! Are you ready to get started? Then let’s go ahead and dive right in. 1. What is the Methacholine challenge test? It is also known as the bronchoprovocation test. It is performed to evaluate how reactive or responsive your lungs are to things in the environment. 2. What can be determined by the Methacholine challenge test? It can help you evaluate symptoms suggestive of asthma. These include cough, chest tightness and shortness of breath. It’s a test that is basically used to help diagnose whether you have asthma. 3. How does the Methacholine challenge test work? You will have the patient to inhale doses of methacholine, which is a drug that can cause narrowing of the airways. This is like what is seen in asthma. Then a breathing test will be repeated after each dose of methacholine to measure the degree of constriction of the airways. The patient starts with receiving a very small dose of methacholine and then the doses will be increased until either there is a 20 percent drop in breathing ability, or they receive the maximum dose with no change in lung function. 4. What bronchodilators should be withheld for 24 hours before bronchial challenge testing? Long-acting inhaled B-agonists and Anticholinergic agents. 5. When should Theophylline be withheld? For 48 hours before bronchial challenge testing. 6. A decrease in sGaw of 35 to 45% may be considered? A positive methacholine or histamine response. 7. What should you conclude after a decrease of 15% after 5 minutes of hyperventilation? The patient is breathing cold air and has hyperreactive airways. 8. What does PC20 represent? A 20% decline in FEV1. 9. What PC2O value is consistent with daily symptoms and requires more serious treatment? A PC20 value of less than 2 mg/mL. 10. What are the nebulizer factors that need to be controlled? Nebulizer output, particle size, and breath-hold time. 11. What is the typical inspiratory gas mixture when performing a eucapnic voluntary hyperventilation study? 5% CO2, 21% Oxygen, Balance N2. 12. What do you call the direct bronchoprovocation test? 13. When is a mannitol test indicated? A patient has cough after exertion and spirometry and lung volumes are normal. 14. A patient should not do vigorous exercise for four hours before what test? 15. How many hours after an exercise test should elapse before another test is performed? A drug that increases the parasympathetic tone in bronchial smooth muscle; it causes bronchoconstriction. 17. What does Methacholine challenge test help with? 18. What are the symptoms of asthma? Wheezing, dyspnea, chest tightness, and persistent cough. 19. What are the absolute contraindications of the Methacholine challenge test? Severe airflow obstruction (FEV1 less than 50% predicted), heart attack or stroke within last 3 months, uncontrolled HTN (systolic greater than 200, or diastolic greater than 100), and a known aortic aneurysm. 20. What are the relative contraindications of the Methacholine challenge test? Inability to perform acceptable spirometry and pregnancy/ nursing mothers. 21. What are the hazards of the Methacholine challenge test? Shortness of breath, cough, chest tightness, wheezing, and headache. 22. What should the patient withhold before performing the Methacholine challenge test? Short-acting bronchodilators (SAB), Medium-acting bronchodilators (MAB), Long-acting bronchodilators (LAB), Oral bronchodilators (OB), and Mediator modifiers (MM). 23. What is the ventilatory reserve? It is the difference between the highest level of ventilation in exercise (VeMax) and the ventilatory capacity. 24. In what type of patients is bronchoprovocation testing used? It is used in patients with bronchospasms who have normal PFTs or nonspecific results of bronchodilator studies. 25. What is a DIRECT bronchoprovocation test? It has high sensitivity and low specificity. 26. What is an INDIRECT bronchoprovocation test? Low sensitivity and high specificity. 27. What are the indications of the bronchoprovocation tests? Diagnosis of asthma, airway hyperresponsiveness severity assessment, and seeing the response of asthma treatment. 28. What are the absolute contraindications of bronchoprovocation testing? Severe airflow limitation where the FEV1 is less than 50 percent, M.I. or ischemic stroke during the past three months, high blood pressure that cannot be controlled, and having a known aneurysm. 29. What are the relative contraindications of bronchoprovocation testing? Moderate airflow limitation where FEV1 is less than 60 percent, recent upper respiratory tract infection within 2 weeks, pregnancy or breastfeeding, and spirometry measurements cannot be performed at an acceptable level. 30. What type of cells does a direct stimulus affect? 31. What type of cells does an indirect stimulus affect? 32. What makes up effector cells? Airway smooth muscle cells, bronchial endothelial cells, and mucus-producing cells. 33. What types of cells make up intermediary cells? Inflammatory cells and neuronal cells. 34. If the direct stimulus is methacholine, then the indirect stimuli is what? 35. If the direct stimulus is histamine, then what is in the indirect stimuli? 36. If the direct stimuli are prostaglandins, then what is in the indirect stimuli? 37. If the direct stimuli are leukotrienes, then what is in the indirect stimuli? Eucapnic voluntary hyperventilation (EVH), Propranolol (beta-blockers), and Hypertonic saline. 38. How long should inhaled short-acting beta agonists be withheld before a bronchial challenge? 39. How long should inhaled LABA be withheld before a bronchial challenge? 40. How long should anticholinergic agents like Ipratropium be withheld before a bronchial challenge? 41. How long should histamines be withheld before a bronchial challenge? 42. How long should caffeine-containing drinks be withheld before a bronchial challenge? 43. How long should leukotriene modifiers be withheld before a bronchial challenge? 44. What is the definition of PC20? It is the provocative concentration of methacholine that causes a 20% decrease in the parameter of interest. 45. What does the PC20 describe? It describes airway hyperresponsiveness. If it is a high value, then the airway hyperresponsiveness is normal and asthma is unlikely. 46. How is nebulizer quality control done before methacholine challenge? The nebulizer is weighed on an accurate scale before and after the delivery of saline. 47. How is the delivered dose of methacholine standardized? By using a fixed number of breaths (usually 5) or by breathing for a fixed length of time (2 minutes). 48. What is the baseline spirometry requirement during a methacholine challenge? It should be greater than 60 to 70 percent of the predicted or the previously reported best value. 49. What are the two methods of delivering methacholine? 5 breath dosimeter and the 2-minute tidal breathing. 50. What does a PC20 response greater than 16 mg per mL mean? 51. What does a PC20 response between 4 and 16 mg per mL mean? 52. What does a PC20 between 1 and 4 mg per ml? 53. What does a PCO2 less than 1 mg per mL mean? 54. What is considered the highest dose of methacholine? 55. How do you know if a patient has asthma from a methacholine challenge test? If the FEV1 decreases at 20% or more at a low dose. 56. What might cause a negative methacholine challenge result? Asthma that has been suppressed by anti-inflammatory medication occupational asthma that is triggered by a specific agent. 57. What are two common side effects of the inhalation of antihistamines? 58. When can a histamine challenge be repeated? Within 2 hours after the patient has returned to baseline. 59. What is the peak action of the histamine challenge? 60. How is the histamine challenge carried out? Subject inhales aerosol by breathing tidally for two minutes. 61. What device is the mannitol challenge carried out with? 62. At a molecular level, how does the mannitol challenge work? It has a hypertonic stimulus (mannitol) that results in the release of mediators from mast cells and basophils. 63. What is the target FEV1 during mannitol challenge? 85 percent times the greatest baseline FEV1. 64. What is a negative mannitol challenge test? When there is a cumulative dose of 635 mg and the FEV1 has not dropped more than 15 percent. 65. What FEV1 makes a subject ineligible for an exercise challenge? If the FEV1 is less than 65%. 66. What does the exercise challenge analyze? Airway heat and water loss during increased ventilation with exercise. 67. When are bronchospasms expected to occur in exercise testing? They are supposed to occur immediately after the exercise rather during the exercise. Most of the time a short period of moderately heavy work is all that is required to trigger exercise induced bronchospasm. 68. When is a repeat exercise test done? After 4 hours because of the refractory period where the bronchoconstriction lessens. 69. What gas concentration is used in eucapnic voluntary hyperventilation? 5 percent mixture of CO2 with air. This gas mixture is used to prevent respiratory alkalosis when the patient is breathing fast. 70. What is the bronchoprovocation/ histamine test used to determine? Responsiveness of bronchial airways & lung tissue to inhaled aerosols & fumes, to establish the diagnosis of asthma in doubtful cases, to provide an indication of the severity of the disease and to determine the treatment regimen and to document the inducing effect in occupational cases. 71. What is the bronchoprovocation/histamine testing procedure? Baseline FEV1 measurements are made prior to administration of drug following each dose administered, an aerosol of the drug is inhaled by the patient, increasing dosages are administered & the response is evaluated by FEV1 determination until the FEV1 falls by 20% or greater in FEV1 is referred to PC20. 72. What are the dosage ranges for the test? 0.03mg/ml increasing of aerosol & increasing by doubling the dose. Maximal dosage is 20mg/ml. 73. What PC20 value is asymptomatic for diagnosing asthma? PC20 value of more than 20mg/ml. 74. What PC20 value generally corresponds to mild episodic asthma? PC20 between 2mg/ml & 20mg/ml. So there you have it! That wraps up our study guide on Bronchoprovocation Challenge Testing, and everything you need to know about the Methacholine Challenge Test. I hope that these practice questions are beneficial for you. Be sure to read through them a few time so that the information will stick. By doing so, this will come in handy once it’s time for you to perform these pulmonary function tests in the real world.